cause an acute; life-threatening condition. Type I aller ic reactions arc mediated primarily by immunoglobulin E (IgE) antibodies. As with all allergies, initiation of a type I response requires exposure to. an .antigen previously seen by the immune system-The reexposure to the anti. gen triggers a cascade of events that then are exhibited locally, systemically, or both in varying degrees of severity. Table 2-3 details the manifestations of type I hypersensitivity reactions and their management. -tion). Although skin and mucosal reactions are not in themselves dangerous, they mJY he the first -indication of more serious allergic manifestations that will soon follow. Skin Ie,:;ions usually take anywhere from minutes tohours to appear; however, those appcaringrapldly after administration of an antigenic drug are the most foreboding. complain of dyspnea and may eventually become cyanotic. Involvement of tire larger airways usually first OCCL:r, at the narrowest portion of those air passages-the vocal cords in the larynx. Angioedema’ of the vocalcords causes ‘partial or total airway obstruction. The patient is usuallyunable to speak and produces high-pitched crowing sounds (stridor) as air passes through constricted cords. As the edema worsens, total airway obstruction ewntually occurs, which is an immediate threat to life. Generalized anaphylaxis is the most dramatic hypersensitivity reaction, usually occurring within seconds or minutes after the parenteral ‘administration of the antigenic medication; a more delayed onset occurs after oral or topical drug’ administration.’ A variety of signs and symptoms of anaphylaxis exist, but the most important with respect ‘to early management are those resulting from cardiovascular and respiratory tract disturbances. cause luss of consciousness and cardiac arrest. Despite the potentially severe cardiovascular disturbances, the usual cause of death in patients having an anaphylactic reaction. is laryngeal obstruction caused by vocal cord edema. will claim an emergency to local anesthetics. 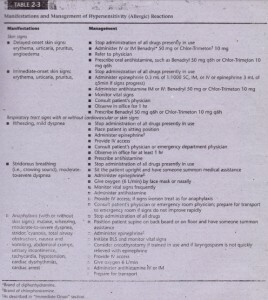 However, before subjecting patients to alternative forms Qf anesthesia, the clinician should try to ensure that an allergy to the local anesthetic does indeed exist, because many patients have been told they had an allergic reaction when in fact they experienced a va50\’ag,11 hypotensive episode or mild palpitations. prominently on the patient’s record in a way to alert care providers but still protect patient confidentiality . allergic reaction is, confined to the skin, or mucosa. 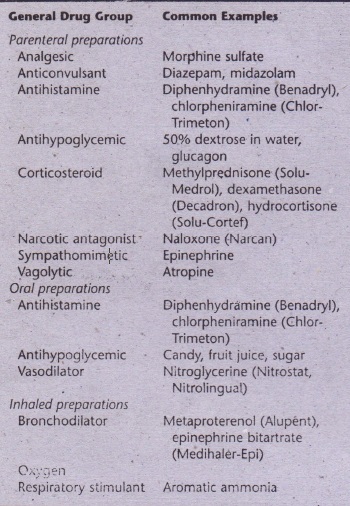 an ant ih istantinc should be administered either IV or intramuscularly JI \ 1), Pi phenhydr.un inc hyd roch Imide IBcnadryl) S() Illg or c.hlorphcniraminc maleate (Chlor-Tr irneton) 10 rug are the commonly chosen ntihistamines. 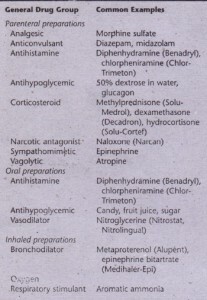 The antihistamine is then continued in all oral form . *As described in “Immediate Onset” section. 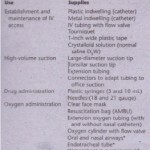 BLS, Basic life Support; 1M, intramuscular; I\~ intravenous: SC, subcutaneous. 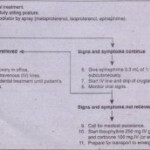 with debilitation diseases, The clinician should consult a drug refercnce book for additional information administration of 0.3 mL of a 1:1000 epinephrine solution, followed by an antihistamine. The patient’s vital signs should be frequently monitored for 1 hour; if stable the patient should be referred to a physician or an emergency care facility for further follow-up . if symptoms recur or continue, the dose can be repeated within 5 minutes. 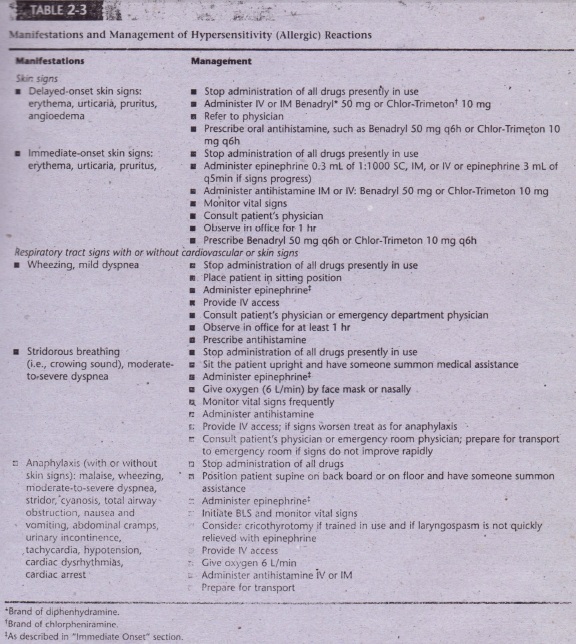 Antihistamines such as diphenhydramine or chlorpheniramine are then given. The patient should be transferred to the nearest emergency facility to allow further management as necessary . should be given. Vital signs should be monitored, and steps necessary to maintain the patient should be taken until emergency assistance is available. Patients who show signs of cardiovascular system compromise should be closely monitored for the appearance of hypertension, which may necessitate initiation of BLS if cardiac output falls below the level necessary to maintain viability or if cardiac arrest occurs (see Box 2-3).